One of the most interesting and beautiful places in California lies only two hours away from Monterey Park. 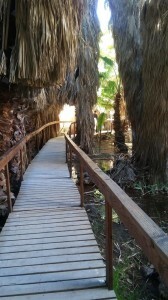 It is the Thousand Palms Oasis located in the Coachella Valley Reserve near Palm Springs. We visited it in the morning, parking our car in a lot close by, then walking to the entrance. We were soon enveloped in a forest of palm trees close to the visitors center, a cabin built of palm tree trunks in the 1930s. 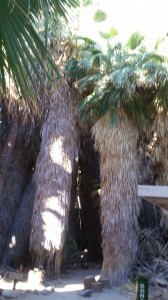 From the cabin we begin our walk through the desert fan palms, the only palm native to California. The trail, dusty at first, becomes a comfortable wooden walkway farther on. The trees are never trimmed, so most of the trunks are hidden in the shaggy texture of old fronds called skirts. We are soon enveloped in the trees and their deep shade, feeling as though we are standing in a primitive era, the way it had been here for thousands of years. The oasis would not exist if were not able to tap into a source of water as the desert around it receives only 4 inches of rain a year and endures summer temperatures of as much as 120 degrees. 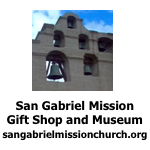 Nearby is the famous San Andreas Fault, the fault line that runs from Southern California to the Bay Area near San Francisco. An offshoot of this fault runs through the oasis, allowing ground water to seep into the surface at this particular place. But what I like to do is pause in the silence of the palm forest and simply enjoy being there, looking at the magnificent patterns of shadows and light, the mesmerizing slow flow of the stream, the ripple patterns reflecting on the shag of the trees and spotting the tiny mosquito fish swimming in the shallow water. At the edges of the water are white patches that look like snow, but are dried deposits of salt and alkali. I like looking up through spaces in the trees at the sky, somehow bluer than ever in this setting. There are some places that are open to the surrounding land, all of it arid and rocky, a sharp contrast to the moistness of the oasis. Out of the water and the damp ground surrounding it, new palms like many-fingered hands are sprouting, later to take their place among the old ones. Looking closer at the palm fronds, I note saw teeth along their stems and filaments as small as threads curling from the edges of their leaves. Salt grass spears poke far out of the water like slender swords. I like the quietness of the place, but people pass us from time to time, their shoes thumping on the wooden walkway. It’s a popular place for young kids and grandpas and all ages in between. Their faces, as they pass us, reflect their joy at being here. A few other trees, like willows and even a stray cottonwood, also take advantage of the water and thrive next to the palms. Eventually the wooden walkway ends, the way ahead lies damp earth crusted with white alkali. The trail gradually leaves the moist earth and enters the sand and gravel of the open desert with its creosote bushes, mesquite, cat’s claw and smoke trees. Smoke trees are found mainly in washes as their seeds only germinate when floodwaters scour them. Younger hikers can continue and eventually reach a small lake, but we turned back as we were more interested in the mystique of the palm forest. Close to the forest grow stands of arrow weed, their tall straight stems, some higher than my head, once being used by the Cahuilla Indians as arrow shafts. People walk through the palms during the day time, but at night owls, jack rabbits, bobcats and coyotes prowl the area. Coyotes are fond of eating the purple berries dropped by the palms. The Cahuilla Indians also ate the sweet berries and relied on the palms for building materials and other uses. The only bird I heard was a lone raven cawing as it flew over the palms, but cactus wrens are said to call from the tops of the trees and orioles build their hanging nests from the underside of the palm fronds. The Thousand Palm Oasis is truly unique. It combines the mystery of the past with the beauty of the present and is well worth a special trip to experience it. .
We enter the deep shadows of the palms. 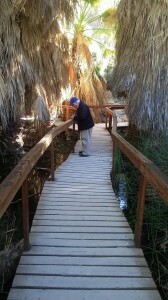 A comfortable wooden walkway leads us through the palm forest. The author taking detailed notes as he strolls through the palms. 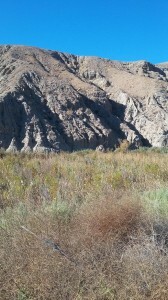 Just outside the oasis the desert is arid and rocky.